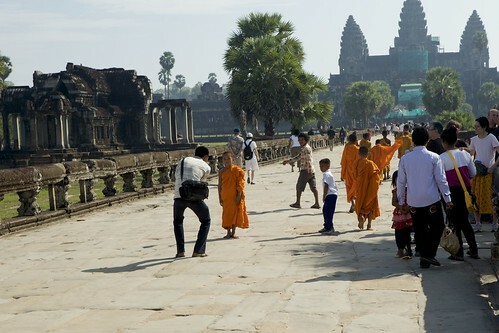 Like the rest of Siem Reap, Angkor Wat was filled with tourists and those seeking the tourists’ dollars. Wherever we went we were nudged and jostled by tour groups and picture-takers. I counted German, French, Spanish, Russian, Korean, and Japanese groups over the course of the day. As young monks wandered through the main temple, they were followed by people with cameras – myself included. Being part of the problem, I can’t exactly complain, but walking through the huge complex of stone and trees and wide open sky, I have to wonder what the experience would be like to explore it without another soul in sight.